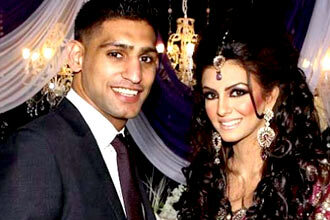 London - Pakistani origin British Boxer Amir Khan going to be marry with Faryal Makhdoom on next week. British Boxer Amir Khan present wedding ring in Bolton Football stadium in presence of thousands of fans. Faryal Makhdoom met with Amir Khan in 2011.